SIGN-UP FOR THE FREE 7 DAY COURSE! This 7 Day Workamping E-Course is delivered via email and is easy to digest in quick printable PDF files you can save and read whenever and wherever you want! Speed through the daily lessons or save the information for when you’re ready to make the decision to go full-time! It’s totally your choice and there is absolutely no pressure! New Here? 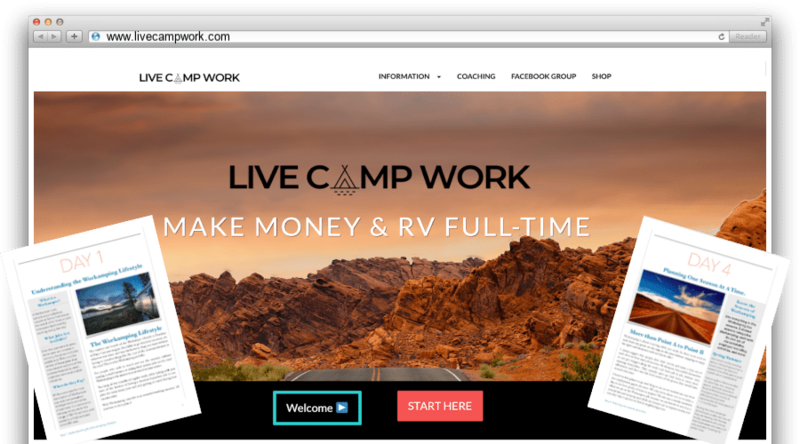 Not quite sure if Workamping is a good fit for you? Try out this FREE 7 Day Workamping E-Course and figure it out! Start with the basics and end with a list of 101 Workamping empolyers you'll want to know about, when the time comes to start setting up your jobs each season! Jump at the chance to learn what you need to know before you go and make the decision that's right for you! This 7 Day Workamping E-Course is delivered via email in easy to digest content and printable PDF files you can save and read whenever and wherever you want! Speed through the daily lessons or save the information for when you're ready to make the decision to go full-time! It's totally your choice and there is absolutely no pressure! Start the 7 Day Course Today! 7 days of education and information delivered right to your inbox! This e-course is designed as a series of PDF files containing the course information for that day. Simply download the PDF, complete any homework assigned for the day, then mull it all over until the next day, when the new lesson arrives. You can complete your course in 7 days, or just go through it at your leisure and take as much time as you need! Before you can do this, you have to know what it is! Start with the basics and everything else will fall into place. Learn what you’re signing up for and what the community is all about. An RV is a very important part of the Workamping lifestyle! You will need one for almost all employer offered jobs, so you might as well pick one that’s right for you! After-all, this will be your new home on the road. You're not on vacation… well not entirely! Changing your mindset to what I like to call a ‘working vacation’ is imperative. If you set off on your adventure in vacation mode you might experience burn out while trying to live life like a tourist rather than one of the locals. Find out how to make the shift! First things first! You can’t attack the whole year at one time. Learn how to plan each season individually, so you’ll never have overlap! This will ensure you don’t have to make the big decision to leave one job early or arrive late to another… costing you an employer reference and possibly a completion bonus. Finding the jobs is a huge task! To be successful, you need to know the process for making sure all your hard work and effort pays off in the end. Let me walk you through my personal 9 step process of getting Workamping jobs! There are always a few Vets who need to be known! Workamping is no different. These 10 programs made my list of Top 10 Workamping employers for one reason or another. Get to know the key players! Sometimes you don’t want to do all the work, I get that. It’s a lot! So, I’m starting you off with 101 employers who hire Workampers during the year. You still have to do some research for the details and how to apply! Grab the Workamping book that was downloaded over 6,000 times in the first 2 months of its launch! Learn the Basics of the lifestyle to get the information you need! Explore Popular Programs with details on specific employers. There's a ton of information about workamping on the internet today, but few resources provide such detailed tips about how to get started the right way and what to expect once you're employed. Don't waste your time spinning your wheels trying to figure it out on your own, this book is a direct path toward making your workamping goals a reality. My husband and I are looking into the work kamping lifestyle and had no idea where to start or if this was even a possibility or just a dream. 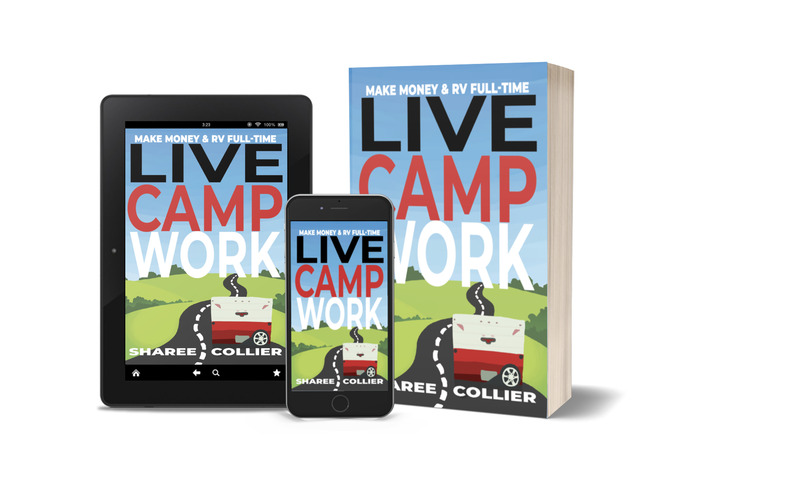 This has so many helpful tips about the lifestyle, jobs, pay and reality of work kamping. I recommend this book to anyone who is looking to get away from the stressful day to day lifestyle and try something new and exciting. My husband and I now know what to expect and how start traveling for a living! Thank you Sharee for putting together such an informative book! This book is packed with great information and links to prospective job leads. I read it in one day and was very impressed. We have been fulltimers for 3 years now and we have never had a problem establishing a workamping position. She covers tons of great items and the booked is packed with fantastic helpful information. I especially liked the info on how to use volunteer.gov and bid with Corps of Engs. as we have always worked in private campgrounds. I would say this book needs to be a regular in any RVers library if you are considering workamping. Well written and very informative! Great inspiration and info! Sharee puts together a very informative book that covers a wide range of questions. Thanks again.